Most classes are also held here. There are two main lines to the subway system (TTC) in Toronto. One goes east-west (Bloor-Danforth line), the other north-south (Yonge-University line). If coming from Pearson International or the Island airport, take a bus or taxi to the nearest subway station of either line, as both lines take you to St George Station. From this station, take the east exit (called Bedford Road) to street level, turn right, walk to Bloor Street, cross the street to Varsity Stadium, turn right and walk down Devonshire Place until you come to Trinity College. From the train station (Union Station), take the University line northbound to Museum Station. Exit on the west side of the station, and orient yourself so the Royal Ontario Museum is behind you on the right, and ahead of you (to the south) is a park with a war cenotaph. Walk down that sidewalk, which curves onto Hoskin Avenue. Trinity College is on your right. Here are several routes to get you to Hoskin or Devonshire Place directly and painlessly. If coming from the east take the 401, exit at Avenue Road, drive south. Follow the signs for Highway 5; when you get downtown, look for Bloor Street and then on your right, look for the Royal Ontario Museum with its very modern addition pointing towards the sky. Move into the right lane, continue right, onto Hoskin Avenue, and there is Trinity College. If coming from the west take the Queen Elizabeth Way (QEW) eastbound which becomes the Gardiner Expressway. Exit at Spadina Avenue and go north to Harbord Street, turn right. Go through two traffic lights (Huron Street and St. George Street), Harbord Street then becomes Hoskin Avenue. Trinity College Chapel will be on your left as you reach the next light. If coming from the north you can take the Don Valley Expressway and exit at Bloor Street. Drive west (right from the exit), and either turn left onto Avenue Road or continue along to the street immediately beside the Varsity Stadium (Devonshire Place), also on your left hand side. There is paid street parking available along Hoskin Avenue as well as Devonshire Place. 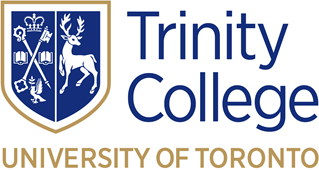 The Trinity College paid parking lot is located between Trinity College and Varsity Stadium and is accessible from Devonshire Place.